With the addition of Cinamaker to the field of contestants I discussed in my July 2018 iOS Head to Head article–Switcher Studio and Teradek Live:Air Action—I set out to determine which app would deliver the best video quality for live streaming and live recording. I am a paying user of Switcher Studio. I use and have made in-app purchases in Teradek Live:Air Action, and I have a standalone review of Cinamaker in progress right now. I have no connection with any of the companies discussed here. While all three offer the ability to record ISO feeds, either in the cameras or in the iPad, if you are streaming a long event—perhaps all day, or over several days—internal recording will fill up, and Apple doesn’t allow for recording to external media. Moreover, if you are livestreaming, then anything having to do with postproduction is irrelevant to the quality you are delivering live. You need to know which solution has the highest-quality live-switched output, period. So the question is, looking only at the live-switched program, for either streaming or recording, which of the three apps delivers the best image quality? At lower bitrates, and set at a level playing field of about 4Mbps and 720p30, I think Cinamaker and Teradek Live:Air Action have less compression artifacts. But when you set each app to their “best” settings, Teradek beats the others, hands down. But this brings up the point of adjusting the image to make your video look the best it can be. This is possible in all three apps, but the way each one does it differs, with varying ease of use and varying levels of success. Let’s talk about Teradek first. With Live:Air:Action, the image controls are those available on the phones used. Teradek offers an Android app too, so it’s not limited to iOS. This means you have to be at the phone to adjust white balance, tint, focus, exposure, etc. This is fine if you have a dedicated operator for each camera. But given that phones are a single, fixed focal length, you don't need camera operators to zoom into a close-up, zoom back out to a two-shot, and so forth. Using fixed focal length devices for cameras makes it easy to set them up with no camera operators. So then, how do you adjust exposure during an event if something bright is throwing off the automatic exposure of the camera? You need someone to run around and do that at each camera. But if you have the phones placed in front of the audience, close to the action, or mounted high up, adjusting the camera settings on the camera itself becomes a problem. 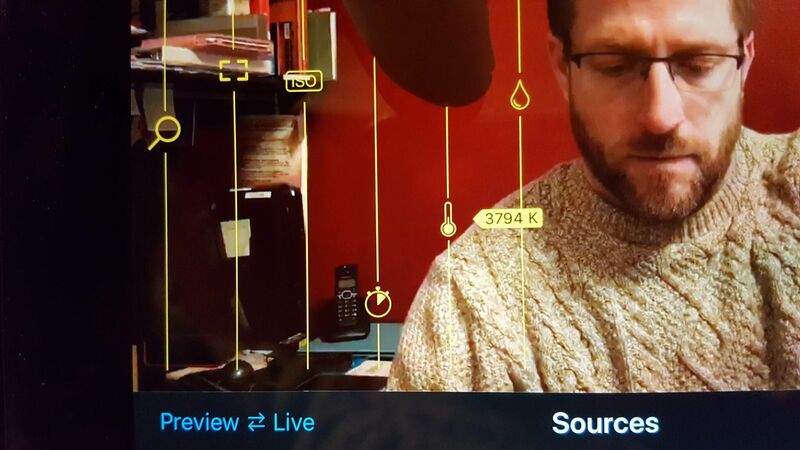 Teradek puts numerical values on each of the adjustment parameters, even zoom (Figure 1, below). This means I can set one camera to Zoom 110%, Tint 6.77, Temp 3000, ISO 500, and Length 0.63, and then easily match that on every other camera. I’d like to see all the camera controls in Remote, Teradek phone app remotely controllable in Action, the mixing app on the iPad. This would enable the operator to easily adjust camera settings on the fly as needed. In the app, there is also the ability to control RGB, for blacks, mids, and whites. There's sharpness control, lens correction (to correct barrel distortion or pincushion common with wide or telephoto lenses on phones), a separate RGB tint adjustment, and a separate Hue control. All of this is available for each camera. The caveat is that none of these RGB controls have numerical values, so matching them precisely between cameras is very hard. The Sharpness control makes a big difference because in the year-plus I've been using iPhones for live video, the images they produce always seem soft compared to an actual camera or camcorder. Being able to “sharpen up” the video before you start mixing it live is huge. But Teradek needs to add numerical values to the RGB, Sharpness, and other controls too. Now let’s look at Cinamaker. Cinamaker has the controls for each camera available in a drop-down menu in the Director app. It seems easy enough, but during the testing I did for this article, I made an error in the settings I chose that caused that camera to use a slower shutter speed than everything else. Cinamaker has a reset button, but it never completely wiped out my mistake. It would fix the exposure, but somehow my screw-up persisted and I had to redo part of the video. 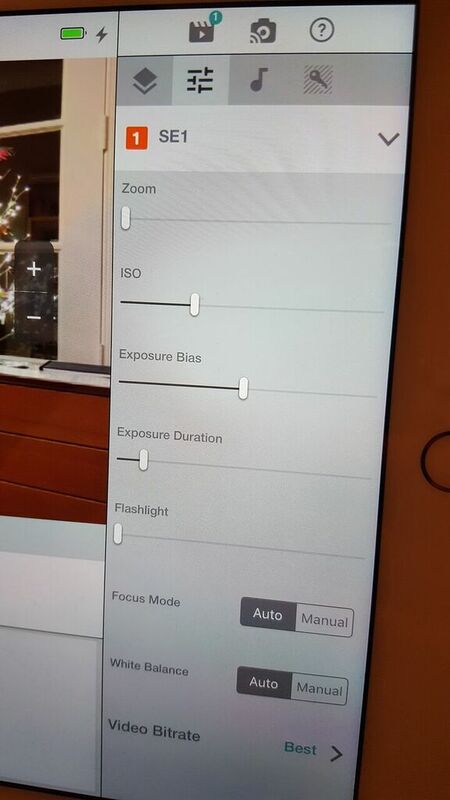 Cinamaker enables you to control zoom, ISO, “Exposure duration” (shutter speed), focus, and white balance for each camera (Figure 2, below). You can also dial in the bitrate for each camera individually. This might come in handy if you have two cameras that are wired for higher speeds, and one that’s wireless, so you can set it lower. There's also an Exposure Bias setting it seemed to make the image brighter or darker, but I don’t know exactly what it does because it’s not the ISO or shutter. There’s also a way to adjust these parameters on the phone itself, if needed. Unlike Teradek’s, the adjustment sliders in Cinamaker are all sort of relative . You move it, and when you let go, it changes, then you have to select it again, and move it back a smidge, and check it again. Let’s say you wanted to match Camera 2 to that. You’d start the process from scratch, eyeballing the individual cameras in the tiny preview windows. In the end, Cinamaker needs to put numbers to these adjustments, and do away with the vague “exposure bias,” even though it did the job of multiple slider adjustments for me. Cinamaker also needs to make Reset really reset everything. And now on to Switcher Studio, which I feel has the most polished interface of all three apps. The interface is intuitive and easy to navigate. The camera controls (Figure 3, below) are in the mixing portion of the app (there’s just one app) and available on the phone. You have easy control of the zoom, ISO, shutter speed, focus, white balance and “tint,” which offers an easy way to pull a tiny bit of green out of a face when these cameras, or fluorescent lights, make a face seem slightly green. 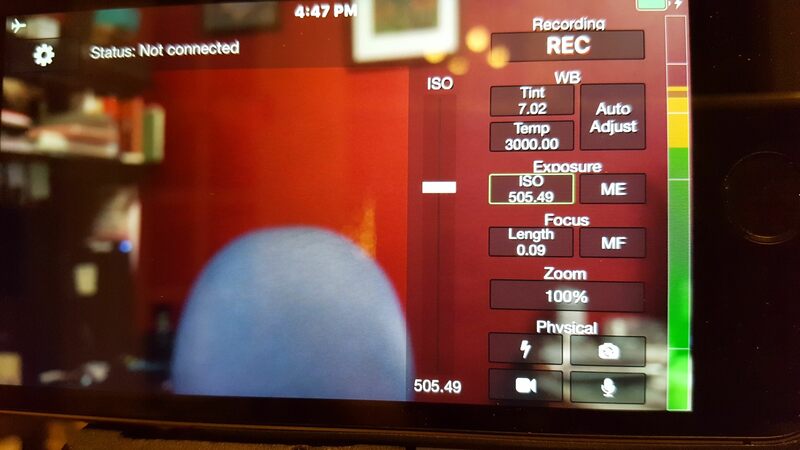 If you are producing a 720p show with an iPhone that's 4K-capable, Switcher Studio’s zoom tells the phone to “crop in” on the sensor. Essentially, this gives you about a 2.2x zoom and still delivers clean 720p video from the sensor. This is much preferred over letting the camera downsample the image to HD, and then enlarging that past 100% as your “zoom”—the pixelated “digital zoom” we’ve all grown to hate. This is a big plus for how zoom is done in Switcher Studio. Switcher Studio does assign a number value to each parameter. You can see it when you make adjustments, and the number goes away when you’re not making adjustments. If you need to refer to it, just touch the control again, without moving, and it reappears. The onscreen sliders make it very easy to tweak exposure during a show. But matching numbers between cameras takes several extra touches to call up those numbers. Maybe leaving them at the bottom of the frame would be a better solution there. In the end, Teradek offers dozens of different control parameters, and they do a decent job of organizing it, but I give the nod to Switcher Studio for ease of use.